Recent protests in Iran have been very likely instigated by the CIA and Israeli Mossad. We only have to remember back to the last Bush administration and the statement “Real men go to Tehran”. The U.S., Britain and Israel have been entangled with Iran for decades, most notably the overthrow of the legitimate government in 1953 (Operation Ajax). “Simply, they’re just the Khalq, the MEK. We began to—I learned about this many years ago. It’s just one of those things that it never quite occurred to me how important it was. And what is important about also the—they did stop, there’s no question, this sort of training that was going on. It was going on at a place called the Nevada Nuclear Security or National Security Test Site. It’s a former site for World War—post-World War II nuclear testing of weapons, testing of nuclear weapons. And it’s off-limits to people. And it’s—there’s an air base there. God knows what went on there. My own guess is rendition flights also flew into that air base in ’02, ’03. There’s some evidence for it. But certainly, the groups of MEK were flown in secretly by, I presume, the Joint Special Operations Command. This is this new high-powered group that’s been doing all the night raids in Afghanistan, that also came up in your news broadcast. “Mossad officials are training Iranian dissident activists to assassinate Iranian nuclear scientists, a NBC News report citing U.S. officials said on Thursday. The report noted, however, that Washington was not directly involvement in the alleged attacks. “Foreign Policy’s Mark Perry reported that the Mossad operation was carried out in 2007-2008, behind the back of the U.S. government, and infuriated then U.S. President George W. Bush. Later, a Sunday Times report claimed that agents associated with Israel’s secret services were behind Ahmadi Roshans’ assassination of an Iranian nuclear scientist. •Part I – Dissuading Tehran: The Diplomatic options. The velvet “color revolution” failed in 2009 when the “green movement” could not convince the Iranian people that it was more than a foreign supported attempt to overthrow their republic. 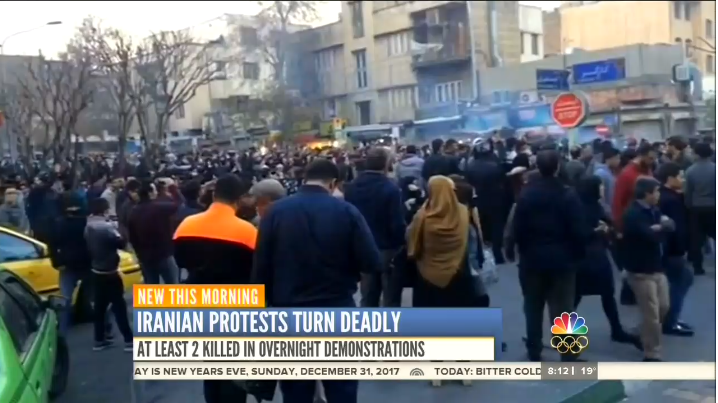 The Iranian protests are certainly not a completely organic movement, the backlash against wages and working conditions has been hijacked to foment a civil war. This entry was posted on January 8, 2018 at 4:59 pm and is filed under Tell the truth and run !. You can follow any responses to this entry through the RSS 2.0 feed. Of course they do and did. No regard for human feelings, suffering and people’s lives. Look at the genocidal effect they brought to Syria. They did and still support the so-called rebels there. one or both books by Victor Ostrovsky. Victor was a Mossad guy years ago.